Andy Warner's The Man Who Built Beirut is a long, complicated story. Here are the companion notes and book/article sources to provide some additional context and information. Page 4, Panel 4: A vital aspect of the Taif Accord not mentioned here is the disarmament of all militias, save one. Hezbollah was allowed to retain its arms to continue to fight Israeli occupation in southern Lebanon. They were widely expected to disarm following Israeli withdrawal in 2000, but refused to do so. Page 5, Panel 5: While Solidere is technically a private company, it was granted the power of eminent domain by the Lebanese government, making it an odd hybrid of public-private. Page 5, Panel 6: In some cases property compensation was worth as little as 15% of market value. The “Stop Solidere” image is from the St. Georges Hotel campaign, which began in 2004. Page 6, Panels 3-5 (above): The main bone of contention was a plan, backed by Syria, to extend Lahoud’s constitutionally mandated single six-year term. Although the previous president, Elias Hrawi had done the same thing, Lahoud was Hariri’s political enemy, and Hariri objected. His opposition to Syrian rule in Lebanon has been vastly overblown in many media accounts. Page 7: Panels 4-7: These bombings, all in Christian neighborhoods were generally taken to be attempts to stoke sectarian tensions in a time of crisis. Their perpetrators remain unknown. 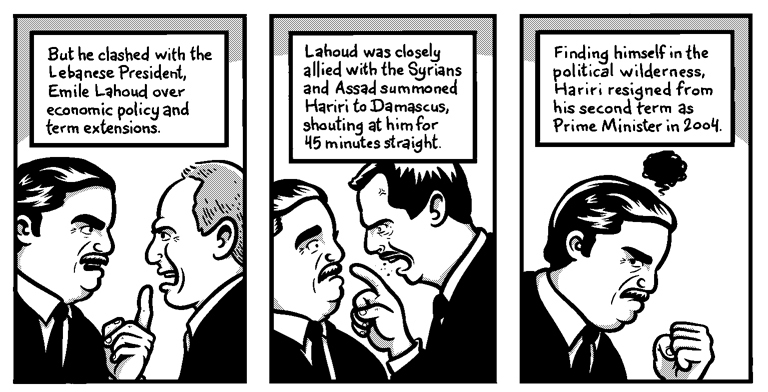 Page 9, Panel 1: Saad Hariri’s ascension to Prime Minister took place in 2009. Fouad Siniora had held the position from 2005 to 2009, heading the first government after the Syrian withdrawal. Page 9, Panel 3: The shift from suspicion of Syria to accusation of Hezbollah was sudden and based on Captain Wissam Eid’s analysis of the cell phone networks active at the time of Hariri’s assassination. Captain Eid (as detailed on page 10, panel 12) was himself killed on January 25th, 2008. Page 10, Panels 1-12: Many of these politicians and journalists were vocally anti-Syrian, but by no means all of them. George Hawi had a complex and changing relationship with Damascus, Elias Murr was staunchly pro-Assad, and Francois Elias Hajj was a supporter of Michel Aoun’s currently pro-Syrian Free Patriotic Movement. Page 10: Panel 7: Bound by narrative considerations, I gave the July War much less space in this story than it deserved. It is as much responsible for the political and social climate of Lebanon today as Hariri’s assassination was. 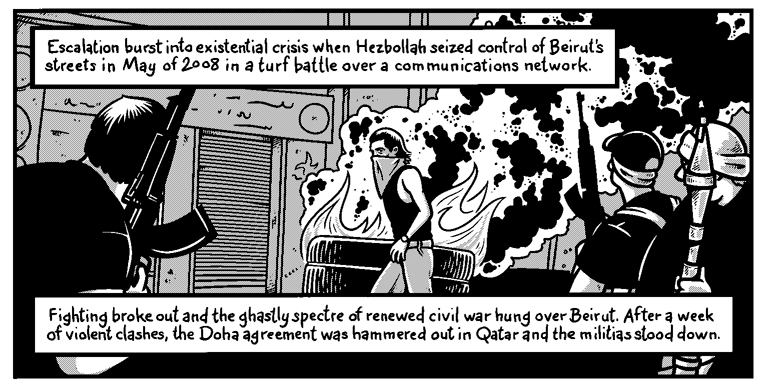 Page 11: Panel 3 (above): The crisis was brought about by the government attempt to shut down Hezbollah’s communications network. The ensuing fighting was heavy, resulting in 66 deaths. The Doha agreement guaranteed Hezbollah veto-wielding power, and cemented their dominance in the Lebanese political sphere. Page 11: Panel 5: I was back in Beirut to work as a guest editor on the excellent Lebanese comics magazine, Samandal. They’re well worth a look. Page 13, Panels 1-6: This dialogue is a combination of a reconstructed conversation and an email exchange with Fadi. It is not verbatim. Blanford, Nicholas. Killing Mr. Lebanon. I.B. Taurus, 2006. Blanford, Nicholas. “Behind Lebanon’s New Political Crisis.” Time Magazine. 13 January, 2011. Fisk, Robert. “Who killed Mr Lebanon? : The hunt for Prime Minister Rafiq Hariri's assassins.” The Independent. 11 January, 2011. Fisk, Robert. “Lebanon in limbo: a nation haunted by the murder of Rafiq Hariri.” The Independent. 14 January, 2011. Fisk, Robert. "How Lebanon can't escape the shadow of Hariri's murder.” The Independent. 12 November, 2010. Fisk, Robert. “The Arab awakening began not in Tunisia this year, but in Lebanon in 2005.” The Independent. 15 April, 2011. Hirst, David. Beware of Small States: Lebanon, Battleground of the Middle East. Nation Books, 2010. Andy Warner is a cartoonist's cartoonist. His drawing chops are impressive, and he approaches his own work with a curious mind that takes him in many different directions. Look around his site, and you'll see horror comics, beautiful screen prints, and large, expertly crafted puppets. Lucky for us, he found himself back in Beirut last summer, and ready to create a fascinating narrative about one of the regions larger-than-life figures. 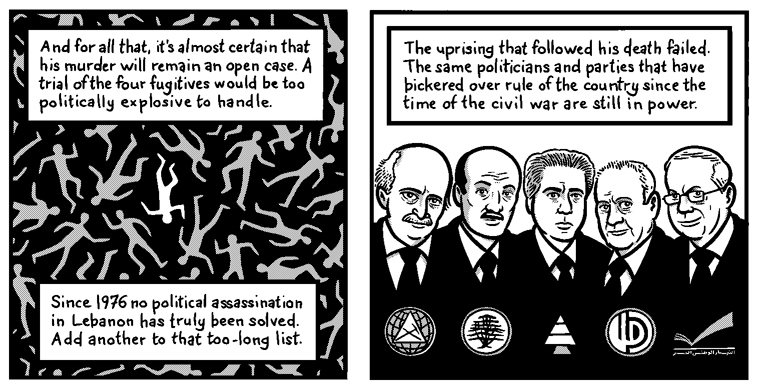 The Man Who Built Beirut is a non-fiction comic, and it has already earned him an Expozine Award nomination and a chance to do work like this for Slate. I'm happy to have the story in Issue 3 and to talk to Andy about it here. Josh Kramer for The Cartoon Picayune: First of all, congratulations for making it through your second winter in Vermont. I hope you're enjoying mud season. You're preparing to graduate from the Center for Cartoon Studies. How do you feel about your comics now versus when you started in 2010? Andy Warner: I'm much better now than I was in 2010. Creating almost nothing but comics for two years surrounded by other people creating nothing but comics had a great effect on my art. CP: This piece is a little different from what I've published before in the Cartoon Picayune, and it's not like the majority of the stories that you do as a cartoonist. What lead you to go for this kind of explanatory first-person story and why was it important for you to get the facts right? A: I was trying to tell the story of my relationship with a place by telling the story of the place. I did this by telling the story of a figure whose death marked both my experience in Beirut and Beirut itself. It was really written to try to come to terms with my own feelings towards the city, so the first-person framing of it felt right. But the events that had an impact on me were political events, and so the story is political by its very nature. I think it's necessary to be as truthful as possible if you're writing about a subject like that. CP: What kinds of research did you do to prepare for this story, and how long did it take you from start to finish? A: I did a lot of research, especially in the beginning. I started trying to write it in the summer of 2011, while I was still in Beirut for the second time. I didn't get past the first page, though. I kept hitting road blocks. Lebanese politics are notoriously complex, and there are a lot of competing narratives. So I put it away, and came back to it in the fall. After starting it again, I finished it in about a month and a half, I think. CP: You ask in your story: "Is Lebanon a lesson, a warning, or an inescapable fate?" So much has changed in the Middle East recently. How would you answer that question now? A: This is the hardest kind of question, I think. The regional politics are still so heavily in flux that I don't think I'd be able to answer that now, if ever. The forces that have driven the changes you're talking about are still playing out. What will a self-styled moderate Muslim Brotherhood mean in Egyptian politics? How will powerful military establishments deal with an erosion of power? I think Lebanon is really an example of an older political order managing to preserve itself in a moment of real national crisis, but probably to the detriment of the country. CP: What did you want to leave the reader with on that last page? A: It's easy to get lost in these things. To go down the rabbit hole of trying to figure out who actually assassinated who, and what it means. But my relationship with Lebanon is more complex than that. More than my relationship, the country itself is more complex than that. I wanted to try to explore those feelings. What the reader gets out of that is their own. CP: This seems like a pivotal moment... what's next for you after you graduate? A: I'll be moving back to the Bay Area. Before that, I'll be at MoCCA Fest in the Spring. Hopefully I'll be at APE in the Fall, too. I'm looking forward to it. It's been a few years since I've tabled there, and it's a great show. Thanks Andy! He retains all rights to all of images in this post. The complete notes and bibliography that accompany the story will be posted here closer to publication. Buy the New Issue Here! 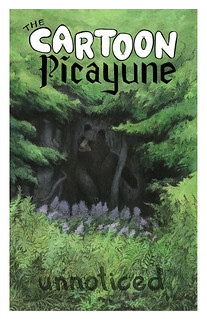 The Cartoon Picayune is an anthology magazine of journalistic reportage completely in the medium of comics.